The RHB Banking Group is the fourth largest fully integrated financial services group in Malaysia. The Group’s core businesses are streamlined into seven main business pillars, namely Group Retail Banking, Group Business & Transaction Banking, Group Wholesale Banking, Singapore Business Operations, Group Shariah Business, Group International Business and Group Insurance. Group Wholesale Banking comprises Corporate Banking, Investment Banking, Client Coverage, Group Treasury & Global Markets, Asset Management and Private Equity. All the seven business pillars are offered through the Group’s main subsidiaries, RHB Investment Bank Berhad, RHB Islamic Bank Berhad and RHB Insurance Berhad, while its asset management and unit trust businesses are undertaken by RHB Asset Management Sdn. Bhd. and RHB Islamic International Asset Management Berhad. 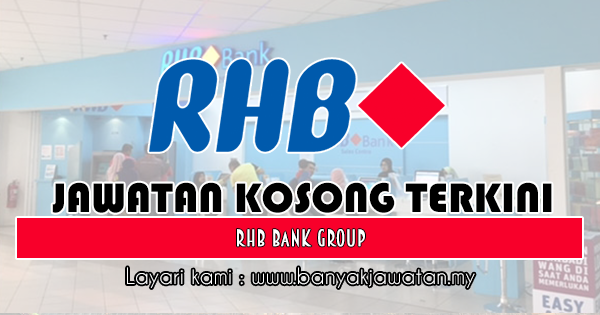 0 Response to "Jawatan Kosong di RHB Bank Group - 3 Mei 2019"